One scratching post is good, but two or three are better. Actually you should consider a post in each of your cat's favourite rooms. More scratching opportunities will of course increase the chances of your cat "doing the right thing", but also offers the cat more varied opportunities. 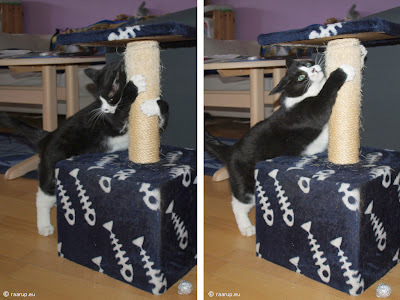 Cats sometimes think in mysterious ways and their idea of the ideal scratching post may very well differ from ours. Try out different types to find out what your cat prefers. As to you scratching the post while the cat is watching, I can verify that it works. My scratching usually inspires the cat to start scratching themselves - as does the scratching of another cat. Hi Michael. Thank you for your kind words. Two weeks ago I knew nothing about declawing as this disgusting practice is not allowed here in Denmark and therefore never has been an issue. I am most grateful that you have pursued the subject so thoroughly - even though it hurts to read about it. I therefore was very pleased to read your page on 'Cat Scratching Furniture' today and that encouraged me to put in my 5 cents on the subject. Let it be known that there are other ways of saving the furniture, namely by allowing the cat to follow it's instincts and scratch where it does not pose a problem. We have cotton covered furniture and that usually should be in great danger for cat claws. Yet our two cats never scratch the furniture. I believe it's because they prefer the sisal rope on the scratching posts to anything else the house can offer. We also trim their nails every two weeks or so - and as Ocimon wrote, it's not that hard to do. Once the cats has gotten used to the procedure they accept it - especially if a little treat is served afterwards. Thanks Finn for your great advice and contribution.